Yesterday, a colleague asked me where I find the time to blog, twitter, etc. This is something I get asked often, but the only answer I have is that I just make time. I put blogging, presentations, sasqag work, and other community stuff right alongside my core work on my todo list. I’m heavily driven by my todo list (I use the tasklist in outlook), and anything I think is important makes it onto the list. I don’t work exceptionally long hours – I just make time for what I think is important. I don’t work exceptionally long hours either – my home life and my work life sort of blend together (I take care of personal stuff during the work day, and work most mornings and evenings from home. I’d estimate that I typically work about 50 hours a week at the most (although that number is a bit higher now as I ramp up on my new job). I suppose it also helps that I think about work a lot. In fact, I write most of my blog posts (including this one) in my head before I sit down to type them out. I use my commute (20 minutes) to think through blogs, papers, projects, and whatever else I’m doing that requires a bit of thought before execution.I don’t have a lot of dead time during my day, but I think that helps keep me sharp. I have one other bit of related advice to share (something I should have included in my gravy train presentation). There is always enough time. I’ve talked to people around the world (mostly testers), and I’m surprised how many tell me that there is some cool thing they want to do…but they just don’t have enough time. “I’d like to learn a new language,,,but I don’t have time”, or “I’d like to look ahead and build a strategy for our team…but we’re just too busy with execution right now”. When people tell me this, I ask- “What would happen if you were sick for a day? So sick you couldn’t even get out of bed?” “Would you be able to “catch up?” Sometimes they try to convince me the world would end, but the conversation always ends with a statement like “it would be inconvenient, but we’d survive”. “Fine”, I say, “if this is important, block some time off of your calendar and make it happen”. You will never get off of the treadmill if you don’t make that time, and if you don’t get off the treadmill, you’re never going to make great things happen. And everyone should get a chance to make great things happen. ed. Adam Goucher pointed me to this article on making time. A fantastic read – thanks Adam. My family moved into a new house about 16 months ago. There’s an office on the ground floor where I set up my pc, my music stiff and a bunch of boxes (mostly filled with books and CDs). I never quite figured out what furniture to buy for the room, but in the end, it didn’t really matter. It turns out that my wife loves my computer (it’s a fanless, ultraquiet system with two 19” widescreen monitors on ergotron arms. She also fell in love with the room – it’s on the first floor, near the front door and kitchen – a perfect place to be if kids are in the yard, eating snacks, or playing around the house. I relinquished the room to her several months ago, but all of my crud was still in there because we never figured out where it should go. Our house has a “bonus room” that we thought would be a kids play room or a TV room, but it didn’t work out well for either of those options. The room is on the second floor over the garage – far, far away from the kitchen and family room. When you have a four and five year old, you don’t necessarily want them playing (or watching tv!) so far away you can’t hear them. Sometime a few months ago, we decided that I could take over the room. It’s a pretty big room, but it will be fun to have a place for all of my book, cds and music stuff. The file cabinet in the corner is a stand-in for a 20-space raxxess rack where I keep most of my electronics. I have a few sets of studio monitors that I’ll put right on the bookshelf – not the best solution, but I think it will work fine. I’m not exactly sure where to put the desk, but that spot in front of the shelves is as good as any. The room is pretty big – not counting the entry hallway, it’s 13×17 (17’ left to right as you view this picture). I have 4 saxophones and 3 guitars that can go behind the chair somewhere, and a bunch of smaller instruments that I can put on shelves, or in the cabinets on the right. Acoustically, the room is a little bright now, but I’m hoping it deadens up a bit once I unpack everything. BTW – if any readers with better decorating skills than me have suggestions, please fire them away in the comments section. 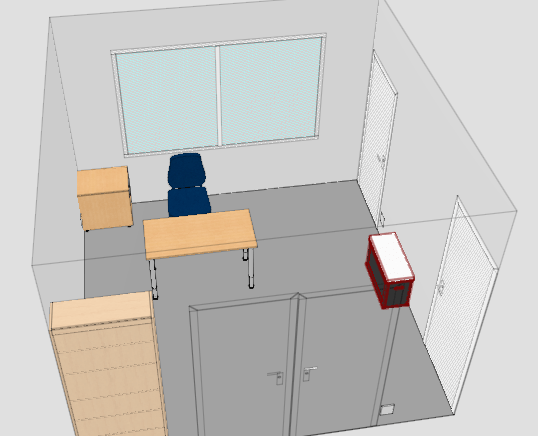 For comparison, here’s my wife’s office (my old office).We’re going to put a foldout couch between the doors and have it double as a second guest room (with my office, I suppose, being a third). Until today, most of the floor space (including inside the closet) was piled with my boxes.I’m pretty sure most of the carpet in that room has never been walked on. I mentioned a week ago that I was giving a talk on career tips called “Ride the Gravy Train”. I gave the talk today (which had a remarkably large turnout), and think it’s a talk I’ll deliver again (with some tweaks). As you can tell, there’s nothing Microsoft specific here (and probably nothing controversial either). As usual, of course, I use few words on my slides (this is the sum of all of the text), and the words I use are too obscure for most people to provide context. Given that it’s my product now, I’m considering doing a live meeting version of this talk (and if that goes well, others). I thought about doing something like this before, but as soon as I suggested it, I got very, very busy. I’m still busy, but at least I can say I’m testing (and I promise to anyone who wants to listen to the talk that I will take every bit of feedback you give me on your experience with the product and get it to the proper people). Not sure when yet, but probably in a few weeks. I’ll post something here and frequently on twitter when I get things squared away. Originally, I was supposed to join the Communicator team today, but a cancelled day of vacation pushed my start date up to yesterday…but there was a meeting I wanted to attend on Monday, so I’ve basically been out of building 21 (EE land) and in or near my new office since Monday afternoon. So, let me tell you’ what I’ve been up to since then! It’s been a bit of a slow start – given that I started early and the pace that the hr backend is updated, I don’t have permission to enlist in the source code yet. On top of that, I’m told it will take a week or two to get my server account moved so I can use the in-development release. I’m also still waiting on my new computer (I still have my laptop and a computer that will become my secondary machine, so I’m certainly not completely blocked). And, despite waiting for permissions, I don’t feel blocked in my ramp up either. I have a 3-pronged approach to ramping up on a test team that is working well for me so far. First off, although I normally don’t like going to meetings, I’ve already attended half a dozen or so. Some, I’m invited to, and others I just tag along. It’s a good way to figure out what’s going on in the project, learn faces, and get a sense of the team dynamic. Secondly, I’ve spent several hours reading through bug reports. It’s great – without talking to hardly anyone, I already have a sense of the types of testing approaches used on the team, a sense of how the database fields are used and interpreted, and even some insight into individuals on the team. I’ve recommended reading bug reports as a way for testers to ramp up quickly on a team for years, and I’m delighted to see that it works. And – I’ve read team wikis, test plans, and whatever other collateral I can find in order to help round out what’s going on. I’ve been reading so much, in fact, that by Tuesday afternoon, my eyes were aching and my vision was fuzzy. So fuzzy, in fact, that I visited the optometrist on the way home for my first ever eye exam. Shortly later, I ordered my first ever pair of eyeglasses. I’ll post photos of my new look as soon as they show up. Today, I made sure I took a few breaks to rest my eyes – I used the time mostly to unpack a few items and tidy up a bit. My new office is now entirely unpacked except for a big box full of random cables that I’m afraid to get rid of because the moment I do, I’ll need one of them.